Generally I am not a fan of pink, but I do like this pink and black combination. You can see I've been playing with my new deco tape. (Because I know people will ask, I got it orientalflea on etsy. It shipped from Hong Kong but was reasonable, especially since I got it on sale.) I colored in some of the hearts... the lace design deco tape does lend itself to such fun. I chose the Marge Simpson stamp because hey, if you're gonna go pink, you might as well go all the way. 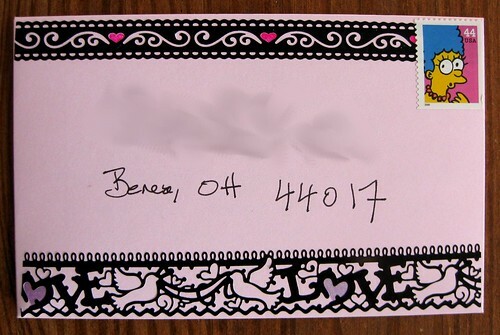 This particular letterset came from a Swap-Bot swap, so I don't know the brand name, but I like the scalloped edge on the envelope flap. 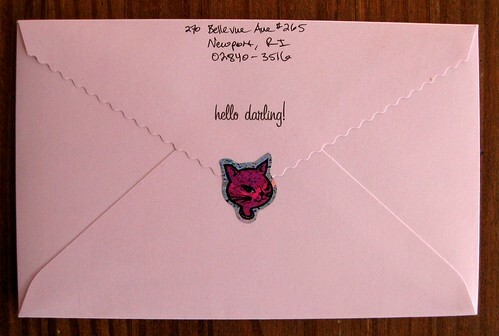 In keeping with the pink theme, I went with a lady cat sticker I got from Janetstore. I guess this is the overseas shipping theme post - Janetstore is in Taiwan. thanks for posting janetstore...so much fun stuff!